Myanmar opposition leader Aung San Suu Kyi Thursday said it was important not to “exaggerate” the plight of the nation’s persecuted Rohingya, hundreds of thousands of whom have been barred from Sunday’s landmark polls. Suu Kyi has faced international censure for not speaking out in support of the Rohingya, a Muslim minority who have been hardest hit by deadly bouts of communal violence in Buddhist-majority Myanmar at a time of surging religious nationalism. The general elections in the former junta-run state are being touted as the fairest in decades, yet hundreds of thousands of Rohingya from western Rakhine state have been disenfranchised. “It is very important that we should not exaggerate the problems,” she told mostly foreign reporters at a press conference in Yangon when asked if the group were victims of genocide. “I am not saying that this is a small problem,” she was quick to add, saying that if victorious her party would secure everybody in the country “proper protection in accordance with the law”. Last week a human rights clinic at the United States-based Yale Law School published an 80-page legal analysis claiming it had found “strong evidence that genocide is being committed against Rohingya”. The United Nations and other rights groups who have condemned the treatment of the community have not used the term to describe the conditions in which the Rohingya live. Some observers say it may be counterproductive in tinderbox Rakhine, where international aid groups have faced hostility from local Buddhists who accuse them of bias towards Muslims. In recent years tens of thousands of Rohingya have fled Rakhine in perilous sea crossings, usually bound for mostly Muslim Malaysia in search of better opportunities. Many were spurred to leave after violent 2012 clashes in the state left around 200 people dead and some 140,000 displaced, mostly Rohingya. Myanmar’s government has insisted that the group do not face official persecution, arguing that the majority are illegal immigrants from Bangladesh, despite the fact that many have lived in the country for generations. In Rakhine, Rohingya face restrictions over employment and travel with many living in bleak displacement camps. Last month Amnesty International said Rohingya faced a “harrowing picture of mob attacks, deaths and disappearances” in Rakhine as it warned traffickers would resume their trade in luring the group out. The lucrative trafficking industry was laid bare in May when people-smugglers abandoned thousands of migrants at sea after a belated Thai clampdown, a crisis that eventually forced a Southeast Asia-wide response. 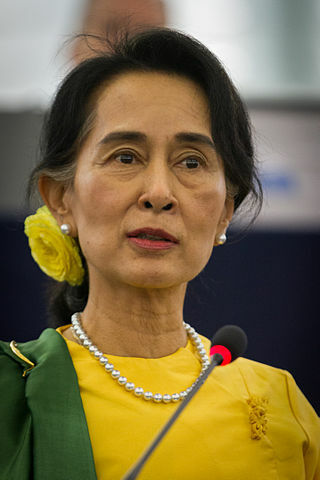 Suu Kyi’s comments came as a special adviser to the United Nations on the prevention of genocide warned of “further marginalisation of religious minorities, in particular Muslim Rohingya”. None of the major parties — including Suu Kyi’s National League for Democracy — have fielded any Muslim candidates in Sunday’s election despite the minority making up some five percent of the population.